When a custom schedule has been created, it is still not able to be used by providers during billing. For a schedule to be used, it needs to be assigned to the providers that should be using it. Click the Tick-Box next to the schedule you wish to assign, then click More and Assign Schedule. A list of all users grouped into practice are listed. 1. Click the Tick-Box next to an Individual User to assign the schedule to that user only. 2. Click the Tick-Box next to a Practice to assign the schedule to each user in that practice. 3. Click the Tick-Box next to All to assign the schedule to every user across each practice. To unassign a user from a schedule, Tick-Box next to the schedule you wish to assign, then click More and Assign Schedule. 1. Click the Tick-Box next to an Individual User to unassign the schedule to that user only. 2. Click the Tick-Box next to a Practice to unassign the schedule to each user in that practice. 3. 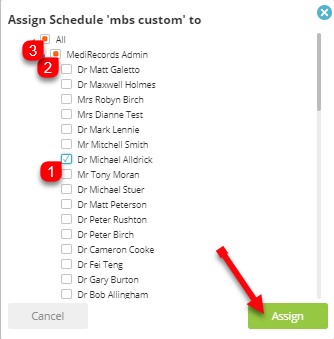 Click the Tick-Box next to All to unassign the schedule to every user across each practice. You've completed another MediRecords Tutorial. You should now be able to assign and unassign schedules. If this is not what you're looking for, head back to our knowledge base and search for another article.